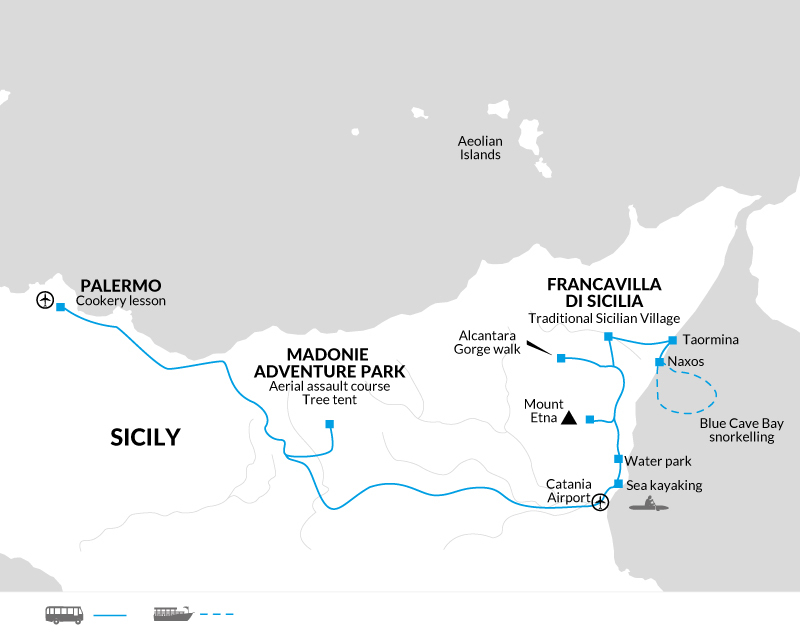 Join us on an active family holiday to Sicily. Try out sea kayaking, snorkelling, cycling, climbing and archery, with one night spent in a tree tent! Hike on the slopes of Mt Etna and learn to prepare fresh gnocchi. Each evening we return to the comfort of our comfortable hotel. Coastal adventures - Try sea kayaking in Isole Ciclopi Marine Park. Arriving at Palermo, Sicily's capital, there may be free time to explore the city which boosts Islamic culture, Byzantine magnificence and the vigorous world of medieval Europe that all merge into a fascinating mix of architecture and decoration. Why not visit the Gothic Cathedral which was founded in 1185 by the Englishman, Walter of the Mill, and its extensive mosaics and beautiful cloisters. Overlooking the azure waters of the Tyrrhenian Sea, Palermo is one of Sicily's cultural and historic highlights. We spend the day exploring some of its treasures today, stopping off at the Piazza Marina to visit Villa Garibaldi - a small garden set amidst some of Palermo's best-known historic buildings. This afternoon we enjoy a cookery lesson of pasta and gnocchi, putting our culinary skills to the test. We get to eat our dishes at the end of the class, a great opportunity for the whole family to get involved! After breakfast this morning we drive 2hrs to the Madonie Adventure Park, for a full day amongst the wooded landscapes near Petralia Sottana. We have a full day to enjoy the parks many delights. You can choose to either brave the assault course through the trees, with zip-lines, rope ladders and 'Tibetan bridges' or try your hand at archery, tree climbing and 'Power fan' (which involves free-falling from high platforms whilst attached to a safety harness). There are five tree tents within the trees set around 6 meters off the ground surrounded by the forest. The tents can accommodate three people per tent with another five tents on the ground which are positioned on platforms for those wanting to sleep nearer the forest floor! The area is illuminated at night and there are toilets close by (just in case you were wondering !). Pack your swimsuits, water shoes, sunscreen and goggles as we experience the islands largest water theme park. The award winning water park boasts over 14 slides all designed for excitement and adventure including; The Black Hole (guests are seated on a 2-person dinghy that slides through a dark and twisting tunnel), Jungle Splash (20 seater boat with a drop of 30 meters towards the splash zone below), Hydro and Dark Kamikaze slides both with steep drops where your back sometimes doesn't even touch the slide, Twin Twister (four slides linked together over 120 meters) and Rafting River with a 4-person dinghy that slides right into the pool. The Wave Pool, the largest in Europe, comes to life every hour for splashing fun. Take a break from the excitement by enjoying a relaxing float around the Lazy River or at the Blue Lagoon, an oasis of rocks and waterfalls. You can also enjoy a hydro massage at the relaxing Hydro Pool. Later in the day we head to our hotel based in the fertile Alcantara valley with an elevated swimming pool and terrace with fantastic views of the surrounding countryside. One of the highlights of our journey is a visit to the slopes of Mount Etna, the highest volcano in Europe (3330 meters) and one of the largest in the world. We'll drive up the mountain this morning, passing through citrus groves and beech woods to Linguaglossa Rovittello where we taste a selection of dairy products and salami. We continue to Curva Sparita which is where the lava flow of 2002/2003 engulfed a part of the old road to Mareneve before arriving in Piano Provenzana (1,800m) where there is the opportunity to view photographs of previous eruptions that have been taken by a local well known photographer. We continue by foot along a path that goes up to the crater of the Northeast side of the volcano to an altitude of about 2,300 m, stopping off at an old Bottoniera (numerous craters formed in 1923 including the longest one on the volcano) where we also stop for lunch. We continue the walk for around 1 ½ hours returning to Piano Provenzana where we meet our transport and visit a volcanic cave which is one of more than 200 caves in the area (1,750 m) before returning by bus to our hotel. This morning, we depart for the town of Taormina. Perched on a cliff overlooking the Ionian Sea, this pretty town is home to an ancient Greek theatre which is famous for one of the most iconic views in Sicily - that of snow-capped Etna, historic churches and a number of lively bars and cafes. We then drive to Naxos where we pick up our snorkeling gear. We visit the Isola Bella Marine Park by rib boat and snorkel in two spots, the Blue Cave Bay and Isola Bella South Side. Snorkelling equipment is provided including; fins, mask, snorkel, wet suit and life jacket. After breakfast we drive to Catania airport where the trip ends. Day 3: Mountain biking. There are a maximum of 10 bikes to hire, this activity is not guided. No charge. In summer you will need clothing for hot, humid conditions. Sunhat, sunglasses, long trousers and long sleeved shirt recommended for protection from the sun. In May and October half-term the sun should still be strong but temperatures will certainly be lower than in the summer months, particularly at night when you will need some warmer clothing and jackets. At any time of year you will feel cold at the top of Mount Etna, therefore you should bring warm clothes, which will also be useful for our night in the tree tents at Madonie Adventure Park. We recommend a good pair of sturdy recreational shoes/walking boots for the short walks, Mount Etna, cycling and climbing and activities in Madonie Adventure Park. Trainers and/or sandals for travelling/beach time. A water bottle, sunhat and high factor sunscreen are all essential. You will need a swimsuit and swim hat and towel for the gorge, as well as beaches and pools, a swim hat is a requirement for the hotel in Francavilla. You may also wish to bring cycle gloves for cycling and while undertaking the ariel course, water shoes for both kayaking and Alacantara gorge and of course cycle helmets for the cycling (though one is provided). A torch is useful in case of powercuts/ emergencies and for inside the tents in Madonie. One of the many attractions of this holiday is staying in tree tents within the Madonie Adventure Park. There are five tree tents within the trees set around 6 meters off the ground and surrounded by the forest. The tents can accommodate three people per tent with another five tents on the ground which are positioned on platforms for those wanting to sleep nearer the forest floor! The area is illuminated at night and there are toilets close by. The forest is also rich in biodiversity and has a wide variety of plants and trees including Chestnut, Pine, Poplar and Beech. The hotel that we stay at for the second half of the trip is located in the traditional Sicilian town of Francavilla di Sicila in the fertile Alcantara valley, rich in history with a choice of restaurants offering fresh dishes from the local area as well as a bakery and ice cream shop. The hotel features an elevated swimming pool and terrace with fantastic views of the surrounding countryside. Due to the volcanic dust and sulphur fumes, we ask asthma sufferers or customers with heart conditions of any kind to take these factors into consideration before taking part in any included activities on Mt Etna. Triple rooms: This trip allows the option for triple rooms to be included within the booking on all night stops within the holiday, with the exception of the tree tents which are suitable for two people in each tent. If you would like this option please ask our Sales team for further information. Average Age: As a guide we have identified the actual average age of the children who have travelled on this trip over the last 5 years, to help you decide whether it's the right one for your family. The average age on this trip is 14 years old, this trip is suitable for active teenagers. This is an epic adventure with lots going on and activities a plenty - from spending the day in a water park that boasts a kamikaze slide to staying in a tree tent - this is no ordinary holiday. We will be mountain biking, walking through gorges, sea kayaking, snorkelling and walking on the slopes of Mount Etna plus trying out pizza making - a great adventure for all the family and for any capability.